We are bowled over with the amazing detail in this collection of forgotten Dark Knight promo shots. 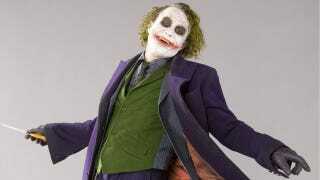 Specifically these gorgeous images of The Joker — the detail on Heath Ledger's costume, face, gloves, it's beautiful. There's even remnants of white face paint on his coat, and the orange lining inside it's all amazing.